It’s TIME for the ultimate team competition as Longines bring us the FEI Nations Cup™ Jumping Final 2017. The Longines FEI Nations Cup™ Jumping final, with national pride at stake this title is coveted by jumpers worldwide. But what is it about this prestigious team competition that adds the fire to the atmosphere that we have witnessed all weekend at the legendary Real Club de Polo in Barcelona. Collective cooperation towards a common goal means that emotions, passions and stakes are quadrupled as a result of the combined, singular desire within the four member team. With the reputation of their nations on the line there is a heightened sense that putting on a strong team performance is essential. Tonight Switzerland, Belgium, Sweden, The Netherlands, The USA, France, Germany and Canada will battle it out for the chance to be the Longines FEI Nations Cup™ Jumping champions 2017. Last night’s unforgettable victory for the UAE in the Challenge Cup once again proved that the will and belief of a nation can overpower the strength of individuals – as they put on a dominant display against traditional jumping heavyweights. Tonight, for the eight qualified teams, teamwork will play an essential factor in who comes out on top. Going into the final the structure and roles within the team could prove imperative with many choosing to field their most experienced riders last. We saw last year how crucial the role of anchor proved to be, as Nick Skelton fought it out with Marcus Ehning in an intense jump off to see who would lift the title, with the latter completing the course in lightning speed to come away with the victory for Germany. The third time they had won the Longines FEI Nations Cup™ Jumping event (2011, 2012, 2016). Tonight Germany look to defend their title with a young up and coming team. Marcus Ehning’s experience could be pivotal, especially if the competition once again comes down to the wire. The wealth of experience of the final rider to go is evident as we see world renowned and highly decorated riders including Mclain Ward, Roger Yves Bost, Eric Lamaze, Steve Guerdat, Gregory Wathelet, Peder Fredricson and Harrie Smolders joining Marcus Ehning in this determinative position. The structure of the team proved crucial for Canada in the qualifying round, as they started their Longines FEI Nations Cup™ Jumping 2017 campaign by finishing the first round in pole position – the only team to finish with zero penalties. This marked an impressive return to form for the Canadians after missing out on a place in the final in Barcelona for the past two years. In the Longines FEI Nations Cup™ Jumping final the role of the Chef D’Equipe is vital. They must be able to harness the team’s passion in order for the best possible result to be produced. Going into tonight’s competition, the scores are wiped and the competition starts afresh. Each team must fully believe they have what it takes to be victorious not only must they have confidence in their own performance but also in that of the team. After yesterday’s competition which saw the underdog prevail, today anything can happen. Now more than ever your nation needs your support. 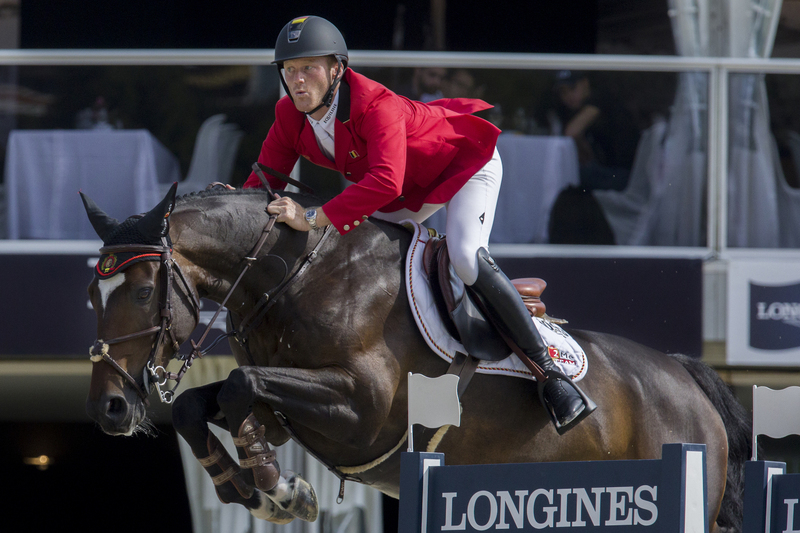 Claire Z ridden by Pieter Devos jumped to victory at the Longines Cup of the City of Barcelona during the Longines FEI Nations CupTM Jumping Final. On Sunday 1st October, the Belgian rider Pieter Devos on Claire Z captured the Longines Cup of the City of Barcelona at the Longines FEI Nations CupTM Jumping Final and received an elegant Longines watch for his remarkable victory. The 2017 world’s best national riders’ team is Team Netherlands who claimed first place at the Longines FEI Nations CupTM Jumping Final yesterday night. In front of an ecstatic audience, Jur Vrieling, Michel Hendrix, Marc Houtzager and Harrie Smolders were all presented with an elegant Longines watch as a reward for their fantastic victory at the Barcelona Real Polo Club. As FEI’s Top Partner, Longines was delighted to be for the first time, the Title Partner of the newly-named Longines FEI Nations CupTM Jumping Final. Besides, Longines has chosen this prestigious event in the show jumping calendar for the European launch of its new model Conquest V.H.P. “Very High Precision”, which represents a new achievement in the field of quartz, combining great precision, high technicality and a sporty look, marked by the brand’s unique elegance. Longines will become title partner of the FEI Nations Cup™ Jumping series as part of a long-term agreement with the Fédération Equestre Internationale (FEI), with the new partnership being celebrated at next month’s Final at the CSIO Barcelona in the Real Club de Polo. Longines, which became the FEI’s first Top Partner in 2013, has also extended its global partnership with the FEI in a historic agreement signed in Gothenburg (SWE) today.